Professor Ulrich Flögel and Dr Sebastian Temme at the University of Düsseldorf are pushing the boundaries of a sophisticated imaging technique. This non-invasive tool can accurately visualise damaged tissue and different cell types in real time. The technology they are developing has huge implications for early and sensitive detection of many diseases including cardiovascular disease, arthritis, and neurodegenerative brain diseases. 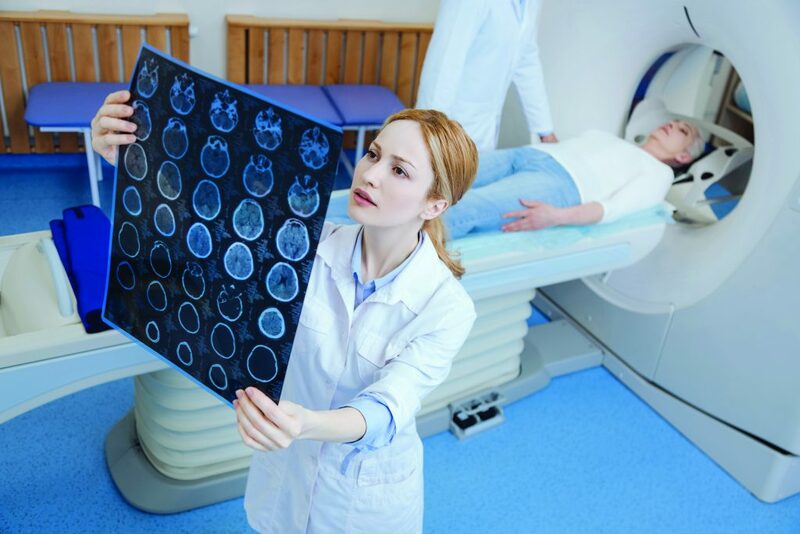 Magnetic resonance imaging, or MRI, is a powerful tool that uses strong magnetic fields and radio waves to produce detailed images of the inside of the body. MRI offers many benefits over other imaging techniques – it is patient-friendly as it is non-invasive, and also gives extremely clear, detailed images of soft-tissue that other imaging techniques cannot achieve. MRI scans can be used to examine almost any part of the body, such as the brain and spinal cord, heart and blood vessels, bones, joints and internal organs. The most commonly used MRI scanning technique typically works by harnessing the magnetic properties of hydrogen atoms to build these images of the body. Certain atoms, including hydrogen atoms, can absorb and emit energy in the form of radio waves when they are in a strong magnetic field. 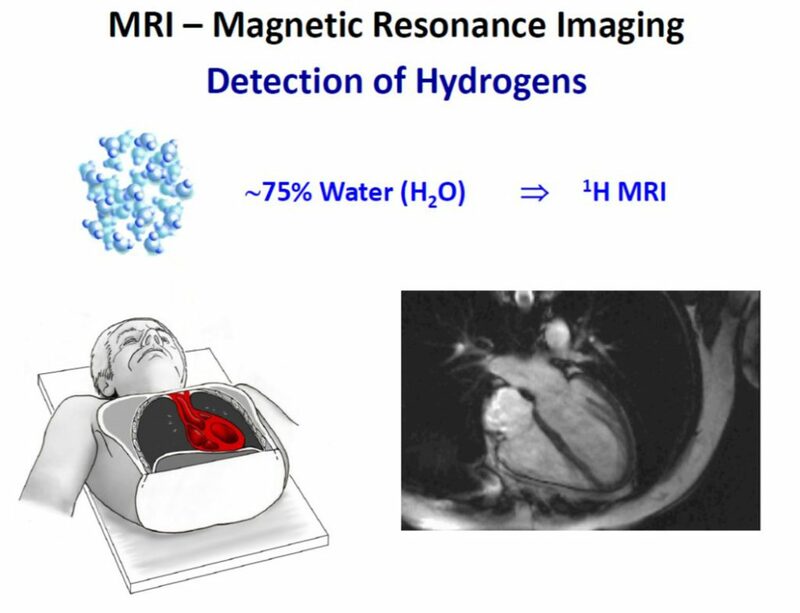 Hydrogen atoms are the most commonly used in MRI as they are present in water and fat and are abundant within the body. In recent years, fluorine MRI (19F MRI) has also generated a lot of scientific interest. This type of MRI scan takes advantage of the magnetic properties of fluorine atoms in molecules instead of hydrogen to build images of the body. Fluorine is naturally occurring and present in vanishingly small amounts in our bodies, which means that any detected signals from fluorine are highly specific – because there is virtually no background signal. The signal emitted from fluorine is very similar to hydrogen. This not only allows similar slightly modified hardware to be used for both, but by merging fluorine-based 19F MR images with the matching MR images using hydrogen this enables the 19F signal to be precisely identified anatomically. Building on this imaging system, Professor Flögel and Dr Sebastian Temme at the University of Dusseldorf are pioneering the development of a sophisticated 19F MRI tool which holds promising potential applications for diagnosis and treatment of a wide variety of diseases. 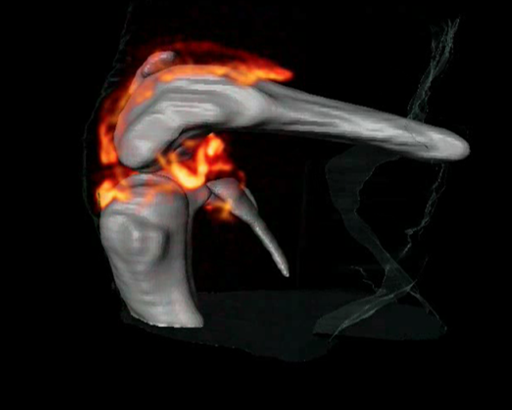 3D 1H/19F MRI imaging of an arthritic knee joint. CREDIT: Supplemental Movie S1: Science Translational Medicine, 2012, 4, 146ra108. Inflammation occurs when the body defends itself against invading microbes or to repair damaged tissue. Inflammation is associated with many diseases including atherosclerosis, inflammatory bowel disease, neurodegenerative brain diseases and ischemic heart disease. The exact diagnosis of these diseases, especially in their early stages, currently poses a challenge: inflamed areas of the body are notoriously difficult to distinguish from healthy tissue. Changing this is Professor Ulrich Flögel, Head of Magnetic Resonance Imaging and Spectroscopy, Molecular Cardiology, and Professor for Experimental Cardiovascular Imaging at the Heinrich-Heine University of Düsseldorf, Germany. 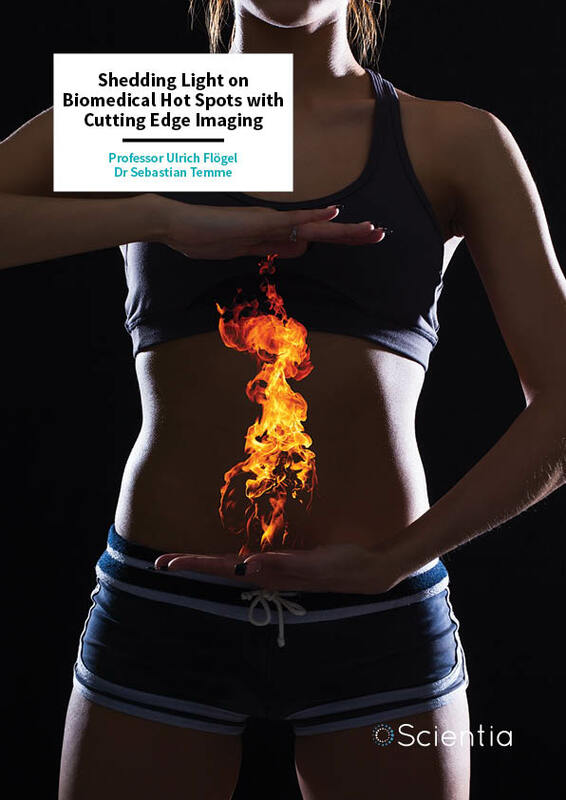 Excitingly, Professor Flögel has developed MRI technology that uses a fluorine-containing tracer, or contrast agent, that specifically targets inflamed areas of the body, and thus can accurately visualise ‘hot spots’ of tissue damage by inflammation. In a 2008 study, the team used a tracer synthesised from perfluorocarbons – a family of unreactive chemicals. Professor Flögel’s tracer of choice was perfluoro-15-crown-5 ether, whose chemical properties make it ideally suited to 19F MRI. Insoluble in water, the compound first needed to be emulsified so that it could be injected into the bloodstream. The researchers optimised the size of the emulsion particle with the aim that it would be selectively taken up by the cells of the immune system. The team injected the emulsion particle containing the contrast agent into the bloodstream of two different groups of mice that suffer from inflammation. By overlaying the MRI images using their perfluorocarbon tracer with complementary high-resolution hydrogen-based MRI images, the team precisely revealed time-dependent accumulation of the tracer in the injured tissue. As Professor Flögel explains, these 19F signals, ‘can be unequivocally identified as background-free hot spots’ of damage by inflammation. The team convincingly showed that the contrast agent was taken up efficiently by monocytes and macrophages – two white blood cells of the immune system that play a key role in inflammation. The tracer was preferentially taken up by these white blood cells circulating in the bloodstream and accumulated in the lymph nodes – the body’s white cell-producing organs. 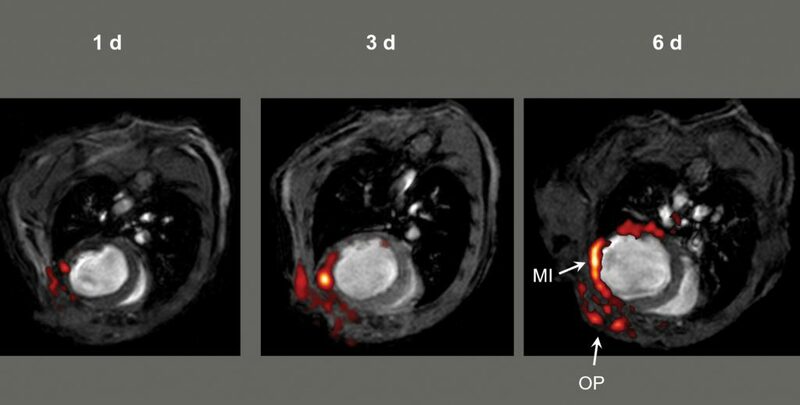 1H/19F MRI imaging after myocardial infarction (MI) – a heart attack. CREDIT: Circulation, 2008, 118, 140–48. Professor Flögel joined forces with immunobiology specialist Dr Sebastian Temme and the pair set out to develop the tool further. Using the same 19F-perfluorocarbon tracer particles, they showed that the 19F MRI signal was directly proportional to the amount of contrast agent taken up by the white blood cells. The team’s finding suggests that not only is it possible to clearly detect specific areas of inflammation, but it is also possible to assess the severity of inflammation damage. This powerful tool holds promise for the early detection of inflammation-related disease, enabling timely treatment and the capability to monitor treatment regimes. Their effective imaging tool has a wide range of therapeutic potential. Indeed, in a recent study, Professor Flögel demonstrated its benefit for Graves’ eye disease. An autoimmune condition, Graves’ disease is characterised by the excessive production of thyroid hormone. A common complication is Graves orbitopathy, or Graves’ eye disease, where inflammation of the eye can cause discomfort and distorted vision. A better understanding of the degree of inflammation in the condition would hugely benefit individuals, providing an opportunity to offer patient-specific treatment. Professor Flögel set out to develop an MRI-based approach to track the inflammation using mice with a form of Graves’ eye disease. Employing his 19F-perfluorocarbon tracer MRI technology, Professor Flögel detected structural changes in the eye – increased swelling and increased fatty deposits – as well as accurately visualising immune cell infiltration to inflamed areas within affected eyes. Professor Flögel argues that this approach of monitoring immune cell infiltration and structural changes to soft tissue can be translated to other autoimmune conditions, and thus offers a broad range of applications. Forging the way ahead, Professor Flögel and Dr Temme have gone on to show that specific, active targeting of 19F-perfluorocarbons can be exploited to visualise other clinically-relevant structures including blood clots and different cell types. A thrombosis is a blood clot that forms with a blood vessel, stopping the proper flow of blood around the bloodstream. This can have serious health consequences, including death, but can be prevented by early identification and treatment. Identification of blood clots in their early stages is challenging: small developing blood clots only have a minor impact on blood flow so do not give a clear signal using conventional MRI, and in its early stages is hard to distinguish from healthy tissue. Professor Flögel and Dr Temme cleverly designed an MRI tracer to specifically detect blood clots in the body. Building on Professor Flögel’s successful 19F-perfluorocarbon tracer, they added a small part of a biologically relevant clotting factor – called α2-antiplasmin – a key protein involved in the clotting process. The α2-antiplasmin fragment was bound to the tracer under very mild conditions, ensuring that it remained biologically viable. Excitingly, the team showed that they could effectively actively target developing blood clots with a diameter of less than 0.8 mm with a very high signal to noise ratio in two groups of mice with thrombosis. Their newly developed method of gently binding a clinically-relevant compound to 19F-perfluorocarbon tracers represented a leap forward. By using the same platform for attaching biologically-active compounds to 19F-perfluorocarbon tracers, the team has also successfully visualised activated platelets and fibrin – both relevant for clot formation. Amazingly, they have also successfully combined the detection of all three simultaneously. Pushing the frontiers of MRI technology, the team is now focussing their efforts on developing a multicolour MRI tool. To achieve this, they use different 19F-perfluorocarbon particles that each have their own distinct MRI ‘signal’, where each tracer particle is viewed as a different colour. In preliminary experiments on human blood clots outside of the body, Professor Flögel and Dr Temme accurately visualised the clot using three colours. Three different 19F-perfluorocarbon particles were targeted to the α2-antiplasmin, the activated platelet tracer and also to the fibrin target described above. This powerful multicoloured MRI approach enables simultaneous detection of multiple targets and has the potential to truly transform MRI. Professor Flögel and Dr Temme are working to further expand their ‘colour palette’ to allow the simultaneous detection of multiple clinically-relevant targets. Their work explores new strategies to increase the sensitivity and specificity of the tool. As Professor Flögel explains: ‘Since ligands and targets can be easily adapted to a variety of problems, this approach provides a general and versatile platform for molecular imaging which strongly extends the frontiers of MRI.’ In particular, the research team is focussed on targeting cardiovascular disease. They are currently working on a novel combined imaging/intervention approach to cardiovascular precision medicine by tracking inflammation during the development of coronary artery disease. In the near future, this exciting emerging field of 19F MRI has the potential to revolutionise imaging-based cell tracking, imaging of disease and drug development. Professor Ulrich Flögel completed a PhD at the Institute of Organic Chemistry, University of Bremen, Germany in 1994. In 1997 he became Research Group Leader in Magnetic Resonance Imaging and Spectroscopy, Molecular Cardiology at Heinrich-Heine University of Düsseldorf, Germany, and in 2014 was appointed full Professor at the same institute. He received the Scientific Award of the Höchst in 1995 and the Edens Award, Heinrich-Heine University Düsseldorf in 2007. 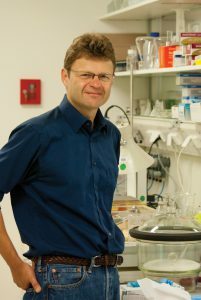 Professor Flögel’s research focuses on the interplay of function, energetics, metabolism, and inflammation and its role in the development of cardiovascular diseases using innovative multinuclear MRI/MRS techniques. 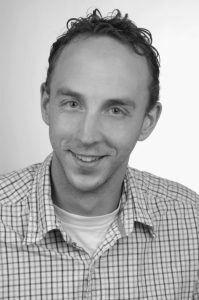 Dr Sebastian Temme undertook his PhD in Immunobiology in 2009 at Rheinische Friedrich Wilhelms University before completing postdoctoral studies first at Department of Genetics, Immunobiology, Rheinische Friedrich-Wilhelms-University, Bonn and then at the Department of Molecular Cardiology, Heinrich-Heine University of Düsseldorf. Dr Temme was awarded the Edens Award of Heinrich-Heine University Düsseldorf in 2015. He is currently principal investigator on the DFG-funded grant ‘Imaging of Thrombo-inflammatory Processes’ until 2020. U Flögel, Z Ding, H Hardung, S Jander, G Reichmann, C Jacoby, R Schubert and J Schrader, In vivo monitoring of inflammation after cardiac and cerebral ischemia by fluorine magnetic resonance imaging, Circulation, 2008, 118, 140–148. 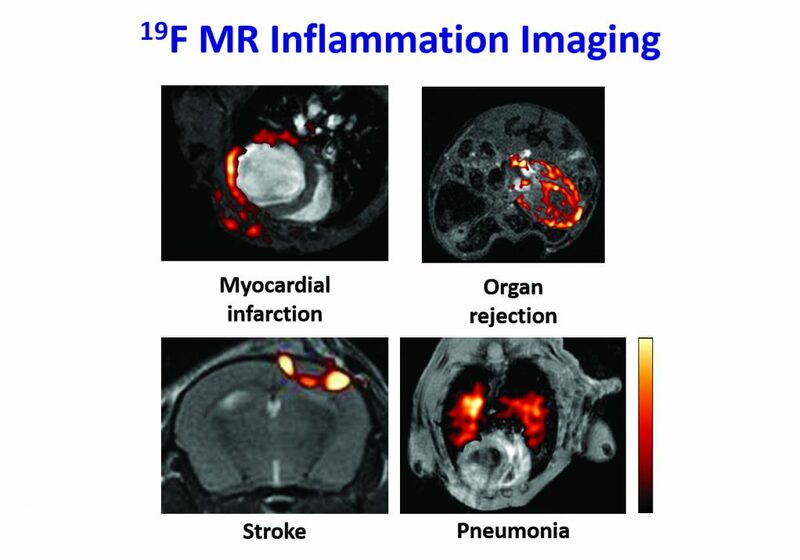 B Ebner, P Behm, C Jacoby, S Burghoff, BA French, J Schrader and U Flögel, Early assessment of pulmonary inflammation by 19F MRI in vivo, Circulation: Cardiovascular Imaging, 2010, 3, 202–10. U Flögel, S Su, I Kreideweiß, Z Ding, L Galbarz, J Fu, C Jacoby, O Witzke and J Schrader, Noninvasive detection of graft rejection by in vivo 19F MRI in the early stage, American Journal of Transplantation, 2011, 11, 235–44. U Flögel, S Burghoff, PL van Lent, S Temme, L Galbarz, Z Ding, A El-Tayeb, S Huels, F Bönner, N Borg, C Jacoby, CE Müller, WB van den Berg and J Schrader, Selective activation of adenosine A2A receptors on immune cells by a CD73-dependent prodrug suppresses joint inflammation in experimental rheumatoid arthritis, Science Translational Medicine, 2012, 4, 146ra108.